I love the late summer in the northwest for it's abundance of fruit. We have peaches, nectarines, plums, grapes, and all kinds of other delicious sweet treats available to us. One of my favorite late summer fruits is the fig. Figs are a pretty amazing fruit. Did you know that the fruit of the fig is essentially an inverted flower? In fact, Mediterranean figs have a co-evolutionary relationship with the fig wasp. The female fig wasp climbs through a hole in the bottom of the fig so that she can lay her eggs inside, thus spreading pollen. And before you go getting all grossed out (cuz I sure did), the wasp lays her eggs in the male capri figs, which are different than the female figs we eat. So, no, you're not in any danger of crunching on any wasp eggs when you eat a fig. In any case, these magical little fruits are an amazing late summer fruit and I love to put them in cocktails. I've made a number of fantastic whiskey drinks with figs, but this time I wanted to try a lighter spirit. When I think of figs, I often think of our old neighborhood in Astoria, Queens. The neighborhood has a very large Greek contingent, and you will often see lush fig trees growing in yards around the neighborhood. That got me thinking about other Greek ingredients that I would combine with figs, which led me to Greek yogurt. Greek yogurt has a unique tanginess to it that I thought would be a wonderful juxtaposition to the sweetness of the figs. And of course, what is more perfect with Greek yogurt, than honey? Many Greek dishes are served with a slice of lemon to enhance the flavors of the food, and that seemed like a natural addition for the cocktail. 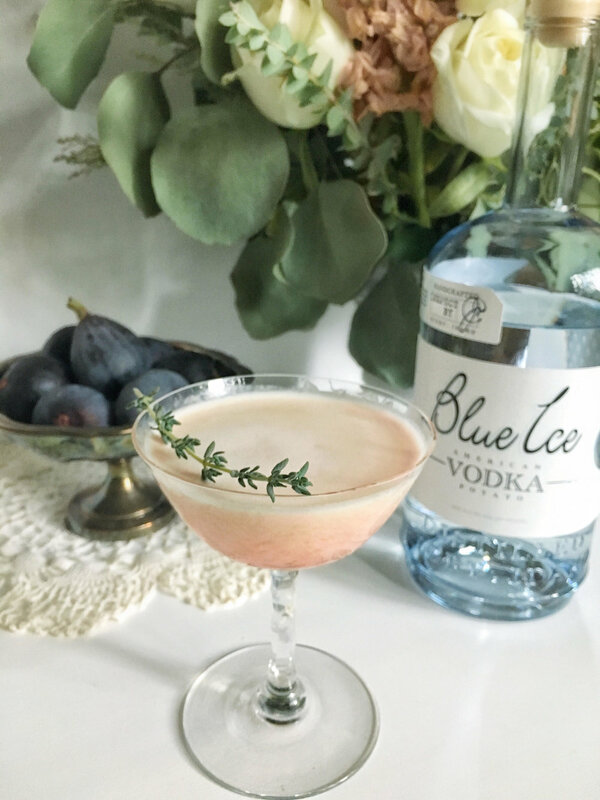 With the addition of a little thyme, all the flavors melded beautifully and it was a creamy, slightly breakfast-y tasting drink. 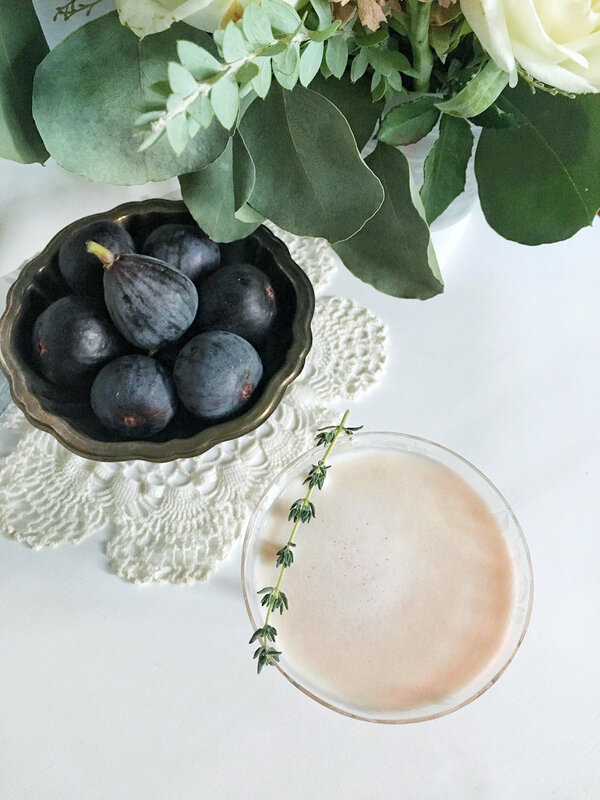 Instructions: Muddle Fig, Thyme and syrup in a cocktail shaker. Add remaining ingredients and shake with ice. Double strain into a cocktail coupe. Garnish with a sprig of Thyme. *Honey Syrup: Combine 1/2 cup honey and 1/2 cup warm water in a bottle or other container. Shake or stir to dilute the honey thoroughly. Store in an airtight container in the fridge for up to 2 weeks.